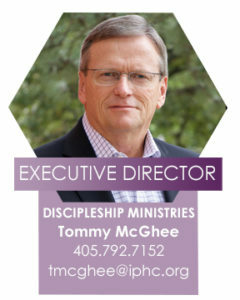 Bishop Tommy McGhee is the Executive Director of Discipleship Ministries and also serves as the Vice Chairman for the International Pentecostal Holiness Church. His vision for Discipleship Ministries is to identify the best discipleship resources available to help put them in the hands of local church leaders where discipleship happens. Bishop McGhee served as Superintendent of the Cornerstone Conference (Western North Carolina) from June 1994 until July 2012. Prior to being Superintendent, he served as the Evangelism & World Missions Director of the Western North Carolina Conference for six years and as a pastor in the conference for twelve years. He joined the Western North Carolina Conference while attending Emmanuel College in Franklin Springs, Georgia. 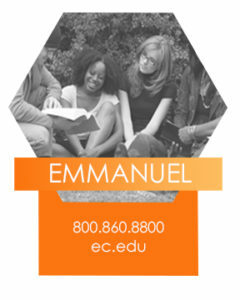 He graduated from Emmanuel College with a B.S. in Religious Studies; and later from Southwestern Christian University Graduate School (Bethany, Oklahoma) with a Master of Ministry Degree in Church Growth & Church Planting. 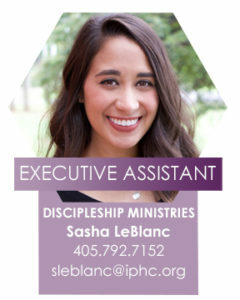 Sasha graduated from Southwestern Christian University (SCU) in 2014 with a Bachelor of Science in Business Administration, focusing in Finance and minoring in Biblical Studies. She continued her education at SCU, completing her Master of Arts in Theological Studies in 2016. She serves in leadership at a local youth ministry, leading worship and assisting with outreach and event planning. Sasha is a young entrepreneur and enjoys traveling, wedding/event planning, board games, photography, and eating sushi with her friends. The Rev. Mr. W. A. Mills, Jr. served for 32 years as a pastor in the International Pentecostal Holiness Church, including 12 years in North Carolina and 21 years in Buena Vista, Virginia. W. A. has preached in camp meetings, revivals, men’s conferences, and pastors’ conferences within and outside the IPHC. He is as a member of the Appalachian Conference where he served one term as an executive council member. 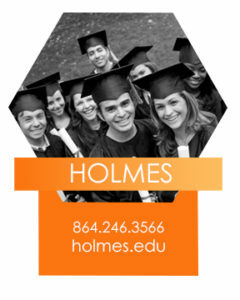 W. A. serves as vice-chairman of the Board of Trustees of Holmes Bible College in Greenville, SC. Widowed in April of 2016, W. A. is the proud father of three young adult children, Rachel, married to David Wilson, Tre married to Megan Amato Mills, and Hannah Nicole Mills. 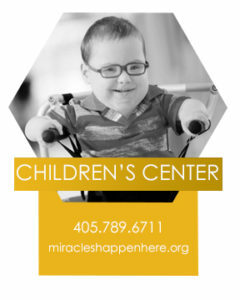 W. A. is the grandfather of two very special grandchildren, Gabriel David Wilson and Calla Ruth Wilson. 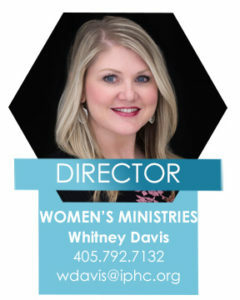 Whitney has worked for over 12 years as a Labor/Delivery and Mother/Baby Nurse, and is now making the transition to full time ministry where the Lord has opened doors for her to continue fulfilling her dreams of encouraging and ministering to women. Whitney grew up in the IPHC and she and her husband, Brad, have pastored in the local church for almost 10 years. 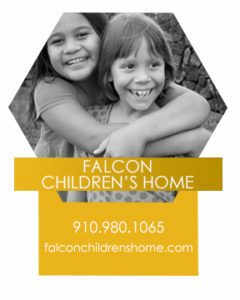 They have a blended family of five children ranging from four to twenty-one years old. She has been in the trenches of motherhood with the “littles” for the past several years, and is excited about this next chapter as her children are growing older and her season of ministry is shifting. Andi and her Husband, Nick, both grew up just outside of Tulsa, OK, then spent 8 years moving around with the Marine Corps. After her husband left the military, they spent a few years in West Texas but have now settled back down in Oklahoma for the long haul. They are the proud parents of two beautiful children, Mattox and Raylan. 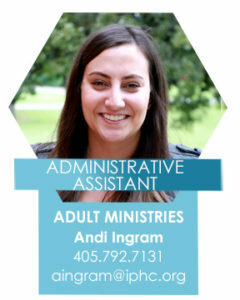 Andi has been blessed by opportunities to work within church ministries since 2015 and feels that her start with IPHC in 2018 is no exception. 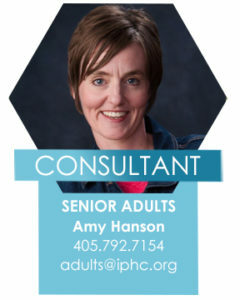 She enjoys volunteering with her local church on the Creative and Connection teams, spending time with her family and friends, and playing board games. She also loves reading and learning new things and is always up for a new adventure. 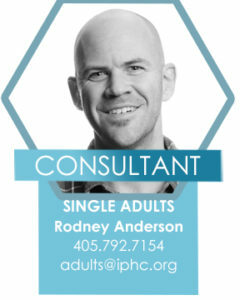 Rodney Anderson is the Director of Singles Ministry for North Point Ministries. 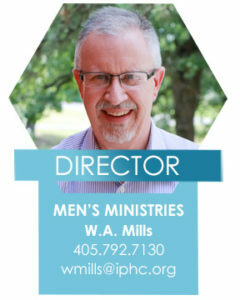 He leads the Singles Ministry staff at all NPM churches and oversees all aspects of their operations. The Singles Ministry is one of the largest in the country at over 1,500 regular attendees. Rodney was born and raised in Atlanta, Georgia and graduated in 2000 from the University of Georgia. He currently lives in Roswell, Georgia with his wife Sarah, his two boys, and absolutely no cats. 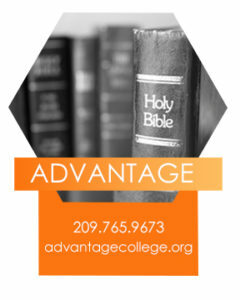 – Leading, teaching, structuring and programming for leadership and ministry-skill development. 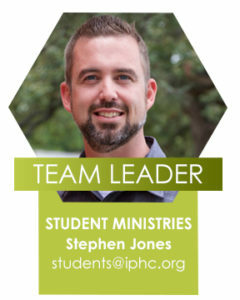 – Advising the team about current developments, resources, and trends related to leadership and ministry-skill development, especially as they relate to youth leaders and youth ministry. 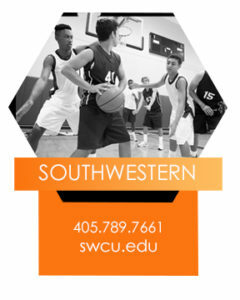 – Serving as a resource for other leaders, especially in the area of leadership and developing leaders. Meredith was born and raised in Southwest Kansas. 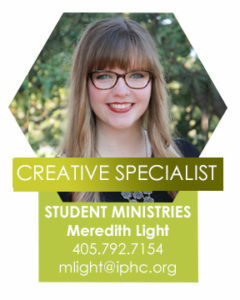 She is a 2017 graduate of Southwestern Christian University and has served in IPHC Discipleship Ministries since 2016. She serves in her local church as the Children’s Pastor and worship team volunteer. Meredith loves spending time with her family, making others laugh, and collecting random miniature figurines/squirrels. Fake squirrels, not real ones. – Experience and expertise as a bi-vocational or volunteer youth leader. 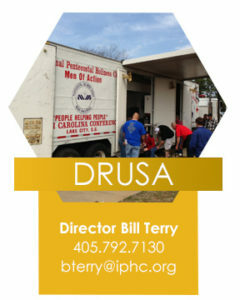 – Advising the team about current developments, resources, and trends related to bi-vocational and volunteer youth ministry leaders. 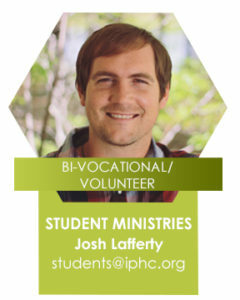 – Serving as a resource and an advocate for bi-vocational and volunteer youth ministry leaders. 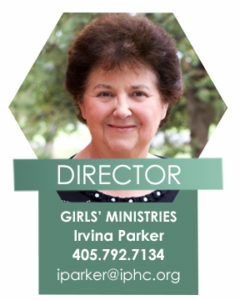 Irvina is serving her fourth term as the director of Girls’ Ministries. She and her husband David reside in Oklahoma City where he serves as president of the IPHC Extension Loan Fund. Irvina has been employed at the GMC since 1974 when she began working part time in Women’s Ministries while attending college. She graduated from Emmanuel College with her Associates Degree and Southern Nazarene University where she received her Bachelor’s Degree in Elementary Education with a concentration in English. Irvina worked in World Missions for about 25 years, some of that part-time while raising their children. During that time, she also served in conference-level leadership of both Women’s and Girls’ Ministries. David and Irvina are active members at River of Life PHC where they have attended for more than 40 years and have served in numerous roles and ministries. Their adult children, Ryan and Jennifer, are both married and have provided them with the thrill of being grandparents. Ryan and his wife, Jessica, are parents to Aubrey and Tristan. Jennifer and her husband Shane are parents to Jasper. Irvina enjoys traveling, photography, scrapbooking, stamping, snow skiing, and spending time with all of her family. 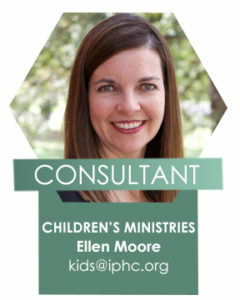 Dr. Ellen (Eby) Moore serves as the Children’s Pastor at The Ark Church, a large growing church in a thriving Houston-suburb, Conroe, Texas. An Oklahoma native with a rich IPHC heritage, Ellen earned her doctorate in Educational Leadership from Oral Roberts University after receiving her undergraduate and masters degrees in Education from Central State University (now the University of Central Oklahoma). After years in public and private education she now enjoys serving kids, parents, and volunteers in her local church by creating environments where kids are connected to Jesus and encouraged and equipped to follow and serve Jesus for the rest of their lives. Ellen is convinced that God has incredible plans for every child’s life right now, not just for when they grow up, and they are changing the world. Ellen has been happily married to her childhood sweetheart, Phillip, for over 25 years, and they’re enjoying the “empty nest” as both of their children, Joshua and Meagan, are in college. When she has free time, you’ll usually find her in the kitchen. 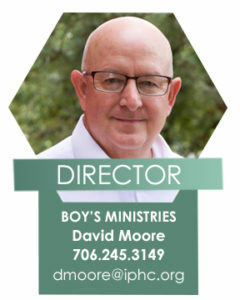 David Moore has served as the National Commander of the Royal Rangers for the International Pentecostal Holiness Church since October 1998. Before coming to the national office in 1993, he worked in the Global Ministries Center accounting office. Commander Moore has been actively involved in a local outpost since 1985. He currently serves as the Senior Commander for his local church and works on a weekly basis with the Ranger Kids outpost.